About Bluey Scheluwee | Bluey Scheluwee & Co.
Posts on Bluey Scheluwee have been increasing by the day and it’s only apt to create an About page for him. Bluey came to us at 3 not long ago and since then has been an amazingly huge inspiration for me to write. I don’t know why, but something about Bluey brings out my imagination and stretches it to unknown limits. 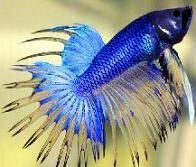 Bluey is a blue fighting fish, very negative, slightly schizo and has a fighter spirit. He’s also very very sarcastic. But now and then, you get to see a flash of emotion that he’s quick to brush off. He used to live in Owner’s home in an aquarium with other fighter fish. But Bluey was unique and couldn’t get along with his own kind. When the other fishes swam around mindlessly, Bluey sought instead to think and question his circumstances. Instead of swimming back and forth in the aquarium, he remained glued to one part of the aquarium, facing Owner’s television set. It was there that Bluey learnt what he knew. He also learnt a lot by observing Owner and her family. As Bluey grew more and more intelligent (or so he thought), so did he grow restless. He realised that by being in the same space as the other ordinary fish, he was being categorised in the same group as them and he wouldn’t have it. As he acted up and became aggresive, Bluey had to be separated and that’s when Owner moved him to a little box aquarium and transferred him to his new home on her desk top at 3.